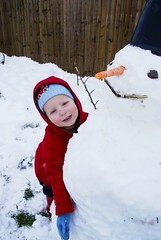 I see your snowman bears a strong resemblance to Tommy Cooper ,,, Fez an' all ,.,. jus like at ! !